This week's Frame of the Week is dedicated to all those fashionistas out there who crave glam, character, style, and originality! 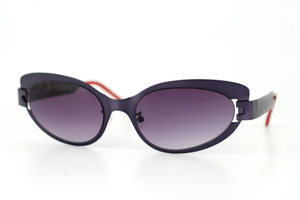 Puri, in purple black matte, oozes charm with a statement that melds the classic with the future! Made of light-weight titanium and humming with velvety color combinations , Puri is sure to become the focus of any ensemble. Look out skyscraper heels -- you've got some competition!